Serena Williams dropped out of the BNP Paribas Open early with a viral illness on Sunday. Williams was in the middle of her match against Spain’s Garbine Muguruza when she was forced to retire. 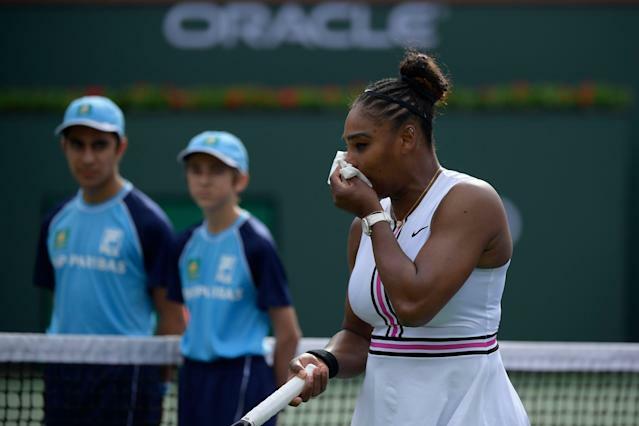 In between the first and second set, Williams sought a trainer to check her blood pressure, and after the first game of the second set, she walked to the chair and had to be checked out again before retiring. Williams, currently ranked No. 10 in the world after missing several months for the birth of her daughter, won the first three games of the match but showed fatigue early on. She proceeded to lose her next seven games, meaning she dropped the first set 6-3 and was trailing the second 1-0 before her departure. "Before the match, I did not feel great, and then it just got worse with every second; extreme dizziness and extreme fatigue," Williams said in a statement. "By the score, it might have looked like I started well, but I was not feeling at all well physically. I will focus on getting better and start preparing for Miami." The 25-year-old Muguruza, who is ranked No. 20 in the world but reached No. 1 in 2017, has given Williams trouble in the past with three wins in six matches. She is one of five players (out of 21 total) to reach No. 1 and not have a losing record against Williams. "Yeah, at the end of the first set, I felt that maybe she wasn't feeling well," Muguruza said, via USA Today. "I don't know. It's really a weird feeling, because I don't feel like I won the match point and (get the) well done, you know, good match (handshake). It was just like, ‘Man, we'll play next time.’ Yeah, I think I played well one set. I'm going to take the positive side of that." Williams was competing in her first tournament since the Australian Open in late January. She plans to compete in the Miami Open, which begins on March 18, and the next Grand Slam tournament is the French Open in late May.